Younger sons born into nobility or the gentry were often sent to serve at the royal court as pages of honor. Part of their education was learning tournament jousting. The master-at-arms used wooden horses mounted on swings to teach skills with sword and lance. 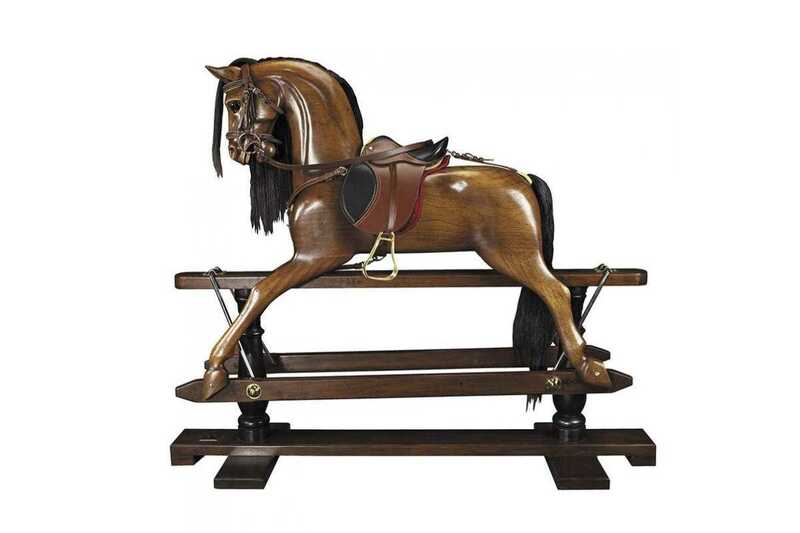 This wooden horse evolved over time into the classic rocking horse. No upper class children’s playroom was without one. Some were mounted on oval wood rockers, others on a ‘safety’ stand, where steel swings allowed for greater movement on a stationary base. Our iconic rocking horse is a full-sized reproduction of originals dating back to the 19th c. Hand carved in top quality mahogany. Hand made saddle and tack of real bridle leather. The expert skills of wood carvers, cabinetmakers, and saddlers are evident. Hand finished in a warm and glowing french-style varnish, slightly distressed to make it look somewhat aged. A timeless treasure and a dream-toy for both boys and girls. Imagine its value in 50 or 100 years!